If you work in an office, the odds are that you spend much of the day in the parked position. Occasionally, you may move into first gear to clear away the coffee mugs that have stockpiled on your desk or to buy a snack. There's probably the odd walk to the photocopier and a climb of the stairs when the lift is broken. But generally, as those of us who are desk-bound know, the most taxing activity for our lungs during the typical working day comes from blowing crumbs off the keyboard. On average, researchers say, we spend 8.9 hours a day sitting down, a figure that's bloated by our sedentary jobs and contributes heavily to the rapid expansion of our waistlines. 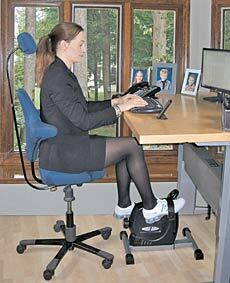 A range of exercise gadgets that claim to keep people fit at work are being launched worldwide. Following on from the Walkstation, a treadmill-desk, comes the Technogym exercise bike, with inbuilt internet access, and the MagneTrainer, which allows you to pedal off your calories while at your desk. But can the at-work work-out really compete with going to the gym? For most people, office weight gain is a slow creep of 2-3lb (1-1.5kg) a year, barely noticeable at first but eventually taking you up a size in clothes. Much of the gain is down to inactivity. Burn just 30 fewer calories a day without failing to raise yourself out of your chair often enough and you'll gain that 3lb in 12 months without even eating more. 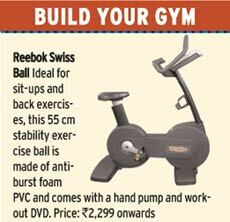 Download these quirky and handy fitness apps on your iPad and iPod and win the battle of the bulge. This three-days-a- week workout programme spans nine weeks and helps you get off the couch and eventually run 5km(3.1 miles) at a stretch. Its latest 1.4 version monitors the workout automatically. Enjoy the benefits of yoga, in the comfort of your home or office. The app allows you to choose from a variety of meditative background sounds and guides your workout through voice prompts and images for postures. An all inclusive fitness programme that helps you get lean and strong with its 60 custom built workouts. This free app also offers audio guidance and on-demand instruction from a Nike personal trainer. Its new 2.3 version comes with a reminder that keeps your fitness levels in check. On average, thin people have been shown to stand up intermittently for a total of two hours longer every day than larger people and, to some extent, jobs determine how often that is likely to happen. In a study commissioned by the American Council on Exercise, John Pocari, a professor of exercise and sports science at the University of Wisconsin, gave pedometers to 98 workers in ten different occupations and found that while postmen, unsurprisingly, topped the league with 18,904 steps a day, even publicans (12,991) and factory workers (9,892) managed considerably more steps than secretaries, lawyers and journalists who amassed a paltry 5,000 steps a day. Even sedentary workers who attempted to offset their chair habit by going to the gym at lunch time or after work added only 2,000 steps to their total, so they still fell below the 10,000 daily steps recommended by the UK Government for maintaining health. Stuart Biddle, a professor in exercise psychology at Loughborough University, who has researched the adverse effects on 'the seated generation' says that people mistake the term 'sedentary' for meaning 'no exercise.' "If someone goes to the gym or walks for 30-45 minutes a day but sits down for the rest of the time, they still have a mainly sedentary lifestyle," Biddle says. "It's about being active and walking about as often as you can." Stress, too, can accelerate weight gain according to a report last year in the Journal of Occupational and Environmental Medicine. Isabel Fernandez, a nutritional epidemiologist at the University of Rochester Medical School, found that stressed employees had a body mass index a point higher than more relaxed colleagues. For someone 5ft 10in (180cm) tall, that is equal to 7lb (3kg) in weight. To make matters worse, the stressed workers also had the unhealthiest behaviour at home. "They go back home and they only want to veg out," Fernandez says. It's not just your own behaviour that influences weight gain. The strongest dietary resolve can crumble when colleagues get the munchies. Professor Brian Wansink, the director of nutritional science at Cornell University and the author of Mindless Eating: Why We Eat More Than We Think, says that typically we eat 30 per cent more calories in company than when alone, and that women are more likely to be influenced by co-workers than men. In one of his trials, Wansink found that women secretaries ate five times more chocolates if they were on a nearby desk than if they had to stand up and walk two metres to get them. In another experiment he showed that office workers sitting near clear glass dishes filled with sweets ate 71 per cent more-77 calories a day-than those sitting near white opaque dishes of the same confectionery. In a year, the clear dish would have added more than 5lb (2kg) of weight. But office work can do more than add extra inches. Swedish researchers, reporting in the British Journal of Sports Medicine recently, found that the desk-bound are more likely to suffer from weight-related health problems than those who move about regularly-they went as far as to suggest that prolonged sitting should carry a public health warning for its ability to raise the risk of disease and illness such as osteoporosis and strokes. According to Biddle, at Loughborough University: "The important thing is that if you get up and walk around every half an hour or so you are less likely to experience these effects." Other than making a concerted effort to move around more, is there anything else that can be done to stem the rise in fat cells? For the past ten years Dr James Levine, a British obesity expert who is now based at the Case Western Reserve University School of Medicine, in the US, has been at the forefront of research into office fitness (or the lack of it). In 2005 Levine led a groundbreaking study which showed that lean people burn about 350 extra calories a day through involuntary movements such as fidgeting, pacing around the desk or walking to the photocopier-which could add up to a weight loss of 36lb (16kg) every year. 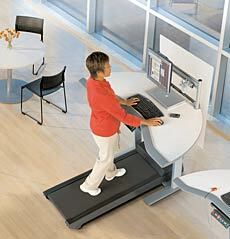 Based on these findings, Dr Levine devised the Walkstation, a treadmill-desk that encourages sedentary employees to incorporate movement into their day by walking as they work. Even though the machine operates at a snail's pace of 2mph, it is enough, he says, to make a difference. Now produced commercially, about 500 of the Walkstations have been sold to companies in America, including GlaxoSmithKline. They are hardly a cheap investment, at more than ï¿½3,000 (Rs 2.22 lakh) each, yet the trend for 'work-workouts' appears to be taking off. 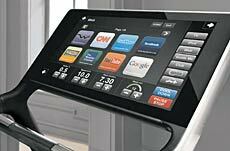 This month sees the British launch of a range of office fitness equipment from Technogym that includes an exercise bike and treadmill, each with an integrated internet connection and access to e-mail on a touch screen that doubles as a desk. This may all seem a step too far until, perhaps, you consider that if you have read this article glued to your seat you will have burnt a paltry nine calories-barely more than you use up simply to stay alive. Had you read it standing up, that would have risen to 16. But if you had paced around slowly the figure would have risen to 25. Work-walk for half a day and 400 calories are gobbled up, the same amount as jogging for an hour. "Our bodies really do want to move," Levine says. "It's just that sometimes our environments suppress it."